Amazing 4th of July Concert: Come and eat hot dogs and burgers, sing and DANCE the night away. 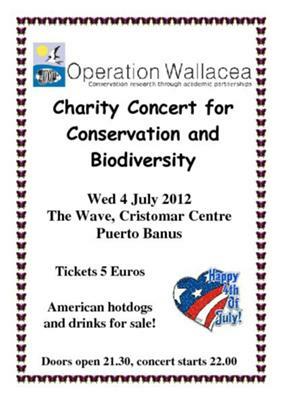 CHARITY CONCERT at the Café Chantant and Fun and Friendship Center THE WAVE. Various Artists for Preservation and Biodiversity. HELP support the environment. Doors open 21.30pm. The best of the best music: always and only at THE WAVE... Everybody welcome!